For this month’s Women In Horror season I wanted to celebrate one of my all time favourite films, the notorious Whatever Happened to Baby Jane. My obsession with Bette Davis and Joan Crawford, and in particular the above mentioned film definitely stems from my own mother. A brilliantly unusual woman, someone who has supported me and encouraged my own eccentricities whilst growing up, it’s no secret that my Mum and I affectionately call each other Blanche and Baby Jane – I tend to be the later, better costumes and wig opportunities! Strange? Well, yes, seeing as the film co-stars are two of film’s most notorious villains but don’t worry there is no dead pet parakeets or rats presented at dinner time! 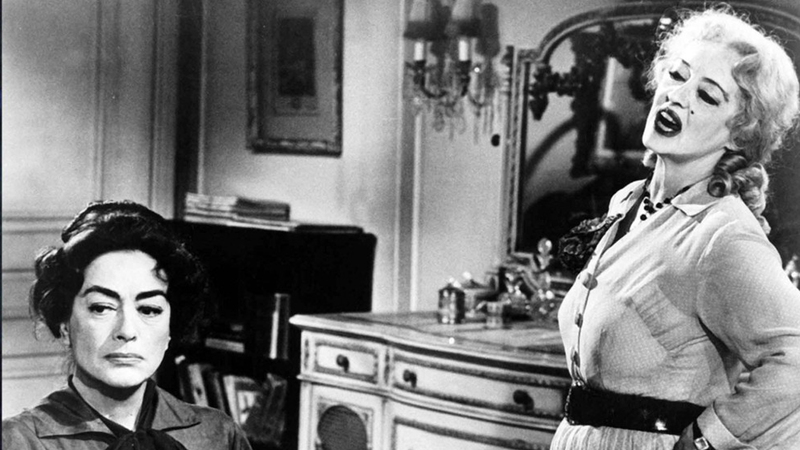 What started with Sunset Boulevard, director Robert Aldrich fully realised with 1962’s Whatever Happened to Baby Jane. The film birthed the sub-genre ‘Grand Dame Guignol’ more commonly known as the ‘hagsploitation’ genre where former leading ladies were granted a ‘comeback opportunity’ starring in low budget horror films often as parodies of their former selves. ‘Hagsploitation’ to me is an ugly term, one that belittles the incredible acting these women portrayed in these mid century horrors. What Davis and Crawford did by being brave enough to make a film like Whatever Happened to Baby Jane shaped the way we see women in film, more specifically horrors. Horror as a genre was widely regarded as phoney, not befitting of Hollywood royalty, of real actors and actresses but Davis and Crawford relished in their roles with the same theatrical dedication they displayed in their previous awarding winning dramatic roles. Their sacrifices on set helped open up Hollywood’s eyes to the older women. The film was a box office smash, grossing over $9 million worldwide with an original modest budget of $980,000. The popularity of the film created a resurgence for Davis and Crawford and the college crowds and late night movie goers delved into the old studio catalogues to once more discover cinematic gems by the leading ladies. The film follows the tragic demise of the Hudson sisters, a gothic tale of past lives, family secrets, jealousy and murder. Performances by Bette Davis and Joan Crawford are electrifying and should not be discounted in both their long bodies of work. Davis in particular steals the show as the un-hinged Baby Jane Hudson, a one-time Vaudeville child star battling mental illness and alcoholism whilst caring for her sister, the disabled former Hollywood star Blanche Hudson. As the sisters face impending eviction from their crumbling mansion Baby Jane’s health spirals out of control as she begins to squander all their savings on drink and frilly costumes for a defunct Vaudeville act. The wheelchair bound Blanche suffers at the hands of her sisters worsening mental health. Marketed as a study of the journey into madness, Whatever Happened to Baby Jane feels claustrophobic, all consuming and increasingly sick as the viewer descends into the sister’s deepening troubles. Director Robert Aldrich used archival films from Crawford’s early career throughout the film, passing them off as Blanche’s old pictures. Crawford is reminded constantly of her mortality as she watches herself on the television and sits, bound to a wheelchair, under a glamorous studio portrait from the early 1930s. These scenes are some of the most harrowing in the film. We see Crawford’s own personal horror of the ageing process both in and away from the lens. Once Hollywood’s most glamorous leading lady, Crawford was now approaching her sixties and facing a new threat – television. No longer a young starlet known for her glamour and beauty, she fought the ageing process not only for her own vanity but for a good script. Both in the twilight years of their careers Crawford and Davis had to fight tooth and nail for projects worthy of their acting abilities. An astute business women, it was Crawford who famously brought the original novel by Henry Farrell to Robert Aldrich and together they fought Hollywood to get the picture made. It proved difficult. The industry just were not interested in two ageing actresses from the studio heydays, in fact Davis was quoted as saying the general response to fundraising for the film was ‘those two old broads – I wouldn’t give you a dime!’. But Whatever Happened to Baby Jane had the last laugh, surpassing initial investments and filming costs in just one week of showings in the East Village of New York. True horror mounts as the final scene plays out where we realise that Baby Jane and Blanche’s monsters are self-created through years of deceit and jealousy. As a viewer I’ve always sided with Baby Jane, her grotesque and demented behaviour towards her crippled sister the result of years of psychological abuse and guilt orchestrated by the embittered Blanche. The depravity, mania and decay of the Hudson sisters is exquisitely displayed on screen by costume designer’s Norma Koch’s creations. You can almost smell the mothballs! Davis is dressed in faded hand me downs from her sister’s acting career, the seams visibly bulging and fastenings gaping. Her shape wear is visible throughout the diaphanous 1930s chiffons and she appears physically uncomfortable in the ill-fitting garments. Koch sized up an old-fashion children’s babydoll and dressed Davis in the dress for the infamously creepy, ‘I’ve Written A Letter to Daddy’ scene. 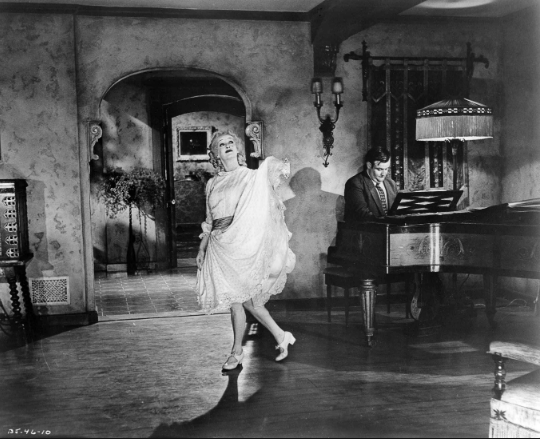 Davis relished creating the grotesque caricature of Baby Jane, something her co-star Crawford did not quite mirror. Unlike Davis, Crawford’s ‘jazz baby’ beauty of the silver screen preceded her and even in her late fifties she still wanted to give the public the full Crawford experience – eyebrows and all. On set there was a continuous battle with Crawford insisting on wearing nail varnish, falsies and even stuffing her bra to appear more voluptuous. This would usually work on previous sets but both Aldrich and Koch were adamant Crawford appeared emaciated to reflect the abuse suffered by her character. In the end it looks like Crawford may have won half the battle. Blanche, a frail invalid bound to a wheelchair for decades, wears a full set of eyelashes, eyeliner and in some scenes, nail varnish. Don’t f**k with Crawford fellas! Whatever Happened to Baby Jane went onto to spark a run of successful (and not so successful) ‘pyscho-biddy’ films like Strait-Jacket (1964), Hush…Hush, Sweet Charlotte (1964) and the inexcusable Trog (1970). Nowadays these films are often celebrated for their kitsch and camp sensibilities but amongst these b-movies were some of Hollywood’s leading ladies most compelling performances in their careers. Casci Ritchie is an independent dress historian specialising in fashion, film and consumer cultures. Her true great loves – film and fashion – began when she watched her first film noir, The Big Sleep, as a teenager and fell in love Bacall and Bogie hook line and sinker. 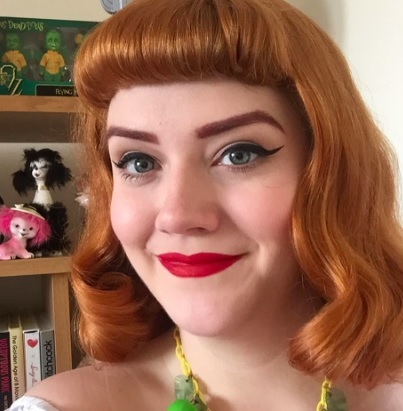 Some of her favourite films include Whatever Happened to Baby Jane, Beetlejuice, Double Indemnity and Cry Baby. You can find her over on Twitter at @CasciTRitchie & her blog www.casciritchie.com.